Nice to see director/producer Benet Catty back in town with another cracking production. 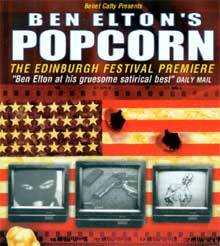 And there is a palpable Mametisation... and funnily enough the play reads better, making Ben Elton's insipid vision of America snappier with added edge. It is to the credit of all involved that they make it hot box office. The dark undertones of Ben Elton's text bubble through the undeniably Hollywood-friendly script which has been meticulously honed to perfection... excellent cast... this genuine thriller keeps you guessing right up to a gruesome conclusion. This adaptation pulls few punches... The cast and direction in this production are both superb, with a constructive use of lighting, music and slow-motion giving the performance an even more Hollywood feel. That the savage satire comes across so well is thanks in no small measure to the superb performances of Jon Drever (Wayne) and Emma Cooper (Scout)... An intriguing production. An electric piece of theatre... a fast-moving and gripping production... Brett Goldstein again in a marathon piece of acting... Director Benet Catty manages to interweave the reality of the hostage situation with the fiction of Bruce's violent films... The cast and director do full justice to one of Elton's funniest plays. Thoroughly recommended. Elton's masterful script-writing.... above all, it's funny. Beautifully timed and thought-provoking, Popcorn is a hilarious look at both Hollywood and real life as we know it. Jon Drever and Emma Cooper are an effectively bonkers pair of psychopaths. This adaptation of Ben Elton's best-selling novel has all the ingredients of a home-made modern British classic... there is a Lock-Stock feel to this production, complete with slow motion shoot-'em up scenes and a hard rock soundtrack... Brett Goldstein confidently assumes the title role of movie mogul Bruce Delammitri (and) wows the audience with impeccable timing and convincing emotion. Jon Drever and Emma Cooper, playing the killers, are impressive in their roles with Drever proving himself to be the star of the show as the TV-educated red-neck murderer... a slick and impressive production with flawless direction and lighting provided by Benet Catty. Very good with strong performances all round... extremely slick and funny. Catty... is a very promising director supported by a cast of good actors... The play starts wonderfully with a real pop video feel to a scene of violence. Catty repeats this throughout the play with great success... This is a very funny production and it is to be hoped that it eventually follows last year's Edinburgh plays from this company to London. It is always exciting and has a buzz that is greatly appreciated by its sell-out audiences. Breathtaking... great acting... Ben Elton would be proud. Easily the best thing I saw there. Fantastic!